How would you describe the flickering of a flame? The twinkling of stars? A bowling ball hitting pins? The texture of an oil painting? Melting ice? Traffic on Route 93 during rush hour? The sound of a cello? The flight of a paper airplane? Breaking glass? The spread of a rumor? A bowl of jello? Digital systems are routinely used to model natural systems for purposes ranging from transmitting realities, to experimenting with possibilities, to realizing fantasies. This course will survey the useful levels of description for such mathematical modeling, including analytical techniques, numerical methods, and model estimation. The focus will be on understanding how the methods relate, and on how they can be implemented efficiently. Introductory experience in linear algebra, calculus, and programming will be assumed. The assignments will include problem sets, programming tasks, and a semester modeling project. 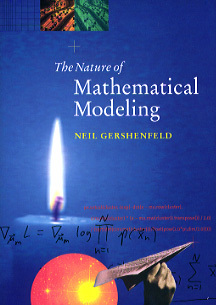 The course will be based on my text The Nature of Mathematical Modeling, with revisions for a second edition to be provided throughout the semester. Each week we will work through problems from the previous week, then introduce new material (which may be incomprehensible until you do the problems). The problem solutions are in the text. DO NOT use them: I am not grading you on the solutions, but I am grading you on how you approach the problems in class. The goal of the problem sets is to introduce applications and to teach you how to think about problem solving when answers are not available; reciting solutions will be obvious to me and useless for you. The goal of the semester project is to give you a chance to apply analytical, numerical, &/or observational modeling techniques to a non-trivial problem that you care about. Examples from past years have included modeling the spread of gossip and of fire, using state-space reconstruction to analyze sounds, and developing a lattice gas model of a polymer. At the end of the semester you will make a short presentation to the class describing (and if possible demonstrating) your project. Class starts promptly at 1. Please come on time: people tend to drift in later during the semester, wasting everyone's time. If you're going to enroll, send your email address to me at gersh at cba.mit.edu so that I can add you to the class alias. Listeners will be admitted based on available space, and expected to do all of the assignments.